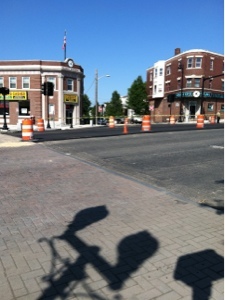 After over two years of construction, closed streets, and robo-calls, the streetscape improvement work in Magoun Square is coming to a close this summer. The committee on Public Works and Utilities, chaired by Ward 5 Alderman Sean O’Donovan, marked *legislative number 189988 (That the Commissioner of Public Works appear before the subcommittee on Public Utilities and Public Works to report on the progress of the Magoun Square reconstruction project and to discuss its completion) as work completed at their gathering last night. This item was sponsored by both O’Donovan and Alderman at Large Bruce Desmond. The closing of this item comes on the heels of a, much discussed, repave of the square from Charles Ryan Road, up Broadway (to the Salvation Army) and down Medford Street (to Partridge Avenue). 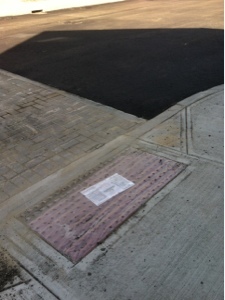 The work was done due to the pavement not setting properly, causing separation near curbs and crosswalks. 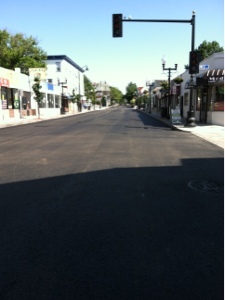 Upon inspecting, the DPW Commissioner and Mayor felt the job needed to be redone. Rumors spread that either the city was paying for the work or that the city would take legal action. Both rumors were put to rest as it was revealed that the State would be working out financial logistics with the contractor. 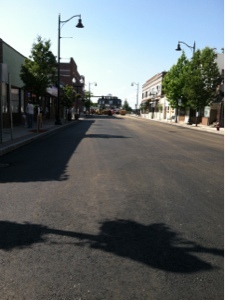 The new pavement will be given 4 weeks to settle before it will be re-striped in August. *The meeting portal has not been updated to reflect a "work completed" status as of the posting time of this story. So will the "new" stoplight at Lowell and Medford ever start actually signaling, or will it blink simply blink red forever? Why will it take four weeks before final road markings will be painted? I don't recall there being such a delay when Temple Street was repaved. Just finish it already. Nothing new about shoddy work done by contractors hired by the city to repave streets and sidewalks. 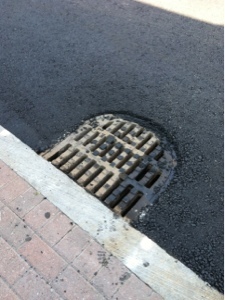 Asphalt and concrete sidewalks have separated shortly after the completion of jobs, particularly where the slope of driveways meet the curbs, and asphalt separating around sewer covers. With these created crevices and winter freezing expansion of these crevices have compounded the problem-----creating even larger crevices. Recent work on Alpine Street and sidewalks a case on point. It appears whoever DPW people are responsible for overseeing the work are either not doing their job; or, do not possess the expertise to qualify as "inspectors." If the lane markings are not done and the street light at Lowell St is not activated, then the job is not "complete". Do you know if the light on lowell st will be functioning soon? I have not been given a timeline on the light, but will check and comment the answer. Also, I was told the pavement needed 4 weeks to properly settle before lines are painted on it. Just a thought in regard to the subject light in Magoun Square, facing Lowell Street, eventually being made full red/full green. I'm no traffic expert, but unless the Lowell and Medford Street traffic control light, when turned to full green facing Lowell Street, is synchronized with a full green facing east from where Broadway and Medford Street intersect----no way will vehicles coming out of lowell Street to go left (west) on Medford Street have ample space to take advantage of a green light due to vehicles, westbound, backed up on Medford Street by a red light facing drivers at Medford/Broadway. In other words, for a left turn to be made out of Lowell, onto Medford,a good distance of Medford Street,going west, from point "A" at Lowell Street, to point "B" where Medford Street terminates at Broadway, the westbound travel lane must be free of vehicles to accept the vehicles coming west out of Lowell Street. Otherwise a full green facing Lowell Street, will be of no use. And we can't forget, if vehicles wanting to execute a left turn onto Medford from Lowell, are stymied from making a left on green, all vehicles behind a left turn vehicle, wanting to make a right, going east, on Medford are also backed up on Lowell. I can hear frustrated eastbound drivers leaning on their horns all the way backed-up on lowell Street if the situation arises. It is my understanding that the light was put there post-research from the traffic engineer, as well as, a submitted petition from a neighborhood resident. It was mentioned at a Traffic Commission meeting that the signees of the petition were from the upper Lowell, Highland Avenue area. This makes sense as they have to deal with a light anyway. I live closer to Magoun Square and did not have my signature solicited for this petition, nor did many Magoun Square abutting residents that I have spoken to.